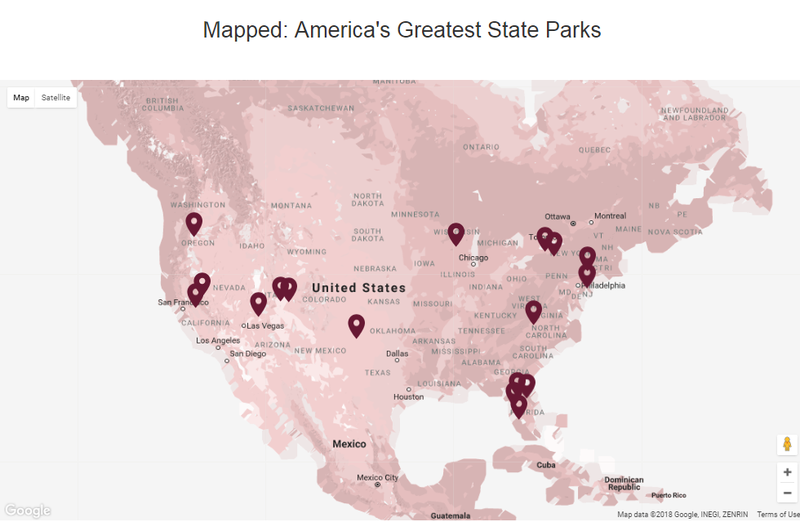 Where are the best state parks in America? From Niagara Falls to Honeymoon Island, these protected areas of outstanding beauty bring environmental, social, and economic benefits to every corner of the USA. With a staggering 8,565 state parks in operation nationwide, almost every town in America is only a short drive away from the nearest one. 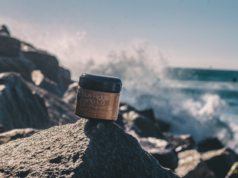 Each park offers something unique to visitors, with activities on offer ranging from hiking to horseback riding, and from surfing to scuba diving. 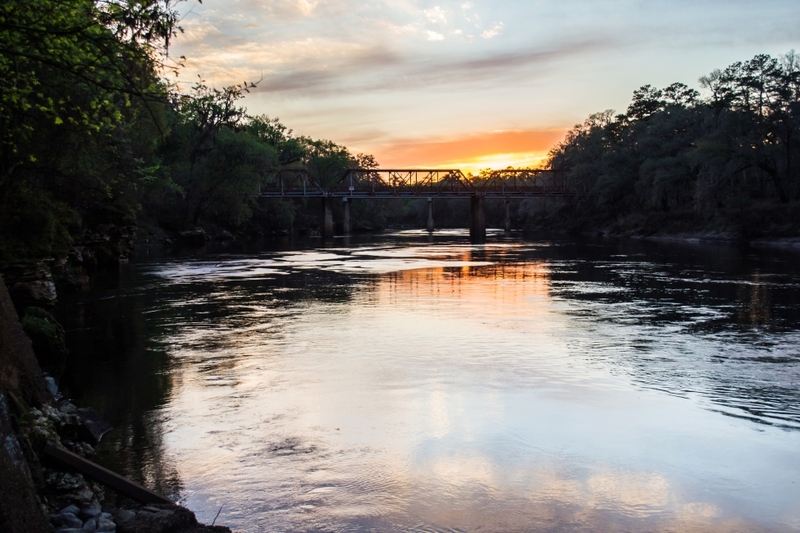 Some state parks are so outstanding that it’s only natural to mistake them for national parks! 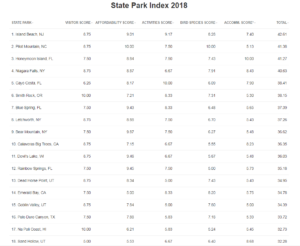 HomeToGo has produced the 2018 US State Park Index, based on five factors important to visitors, to help you find the best state park for your vacation. We researched the average visitor rating, the affordability of parking and entry, the number of activities on offer, the diversity of bird species, and the availability of nearby accommodation for each of the 18 parks in our spectacular shortlist. America’s state parks welcomed 807 million visitors in 2017. More than 66 million people stay overnight in state parks each year in tents, cabins, and lodges. All 8,565 American state parks cover a total of18.7 million acres of land. Honeymoon Island State Park in Florida has been crowned the 3rd best state park in America! 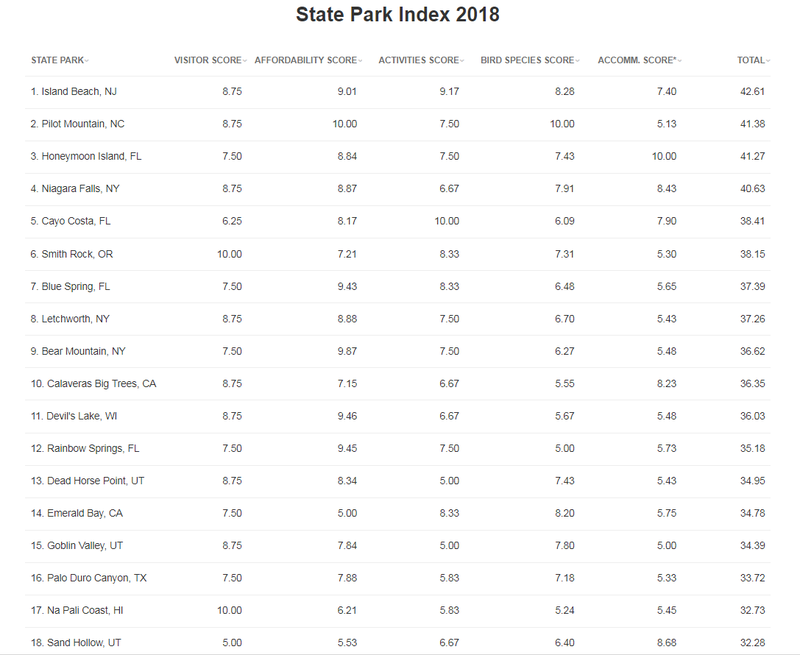 The much-loved state park scored an impressive 41.27 out of 50 in this year’s ranking. 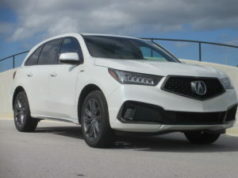 #3 Honeymoon Island, FL: Boasting secluded, sun drenched beaches and remarkably clear waters, Honeymoon Island State Park is a small piece of paradise located just off the western coast of Florida. 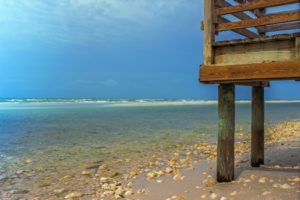 Despite being within easy reach of Clearwater and Tampa, this barrier island offers a much more relaxed vibe compared to the busy mainland. Swimming, boating, and fishing are especially popular. 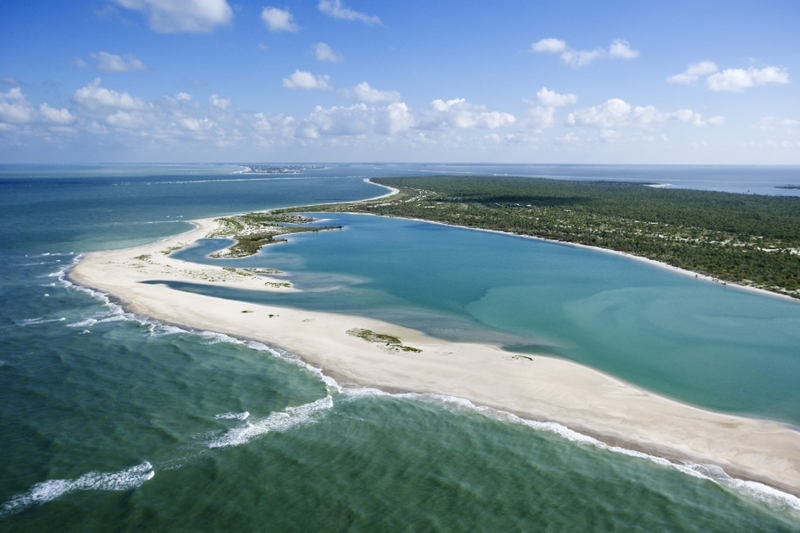 #5 Cayo Costa, FL : Cayo Costa is perhaps the most secluded and intimate of America’s state parks. 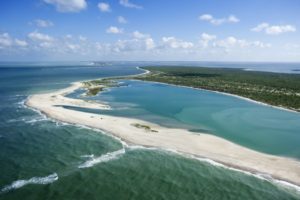 Accessible only by private boat, helicopter, or ferry, this entirely undeveloped barrier island off the coast of Florida is truly serene and idyllic. Those who are lucky to experience this magical park can expect to see dolphins and manatees drifting around its tropical waters. 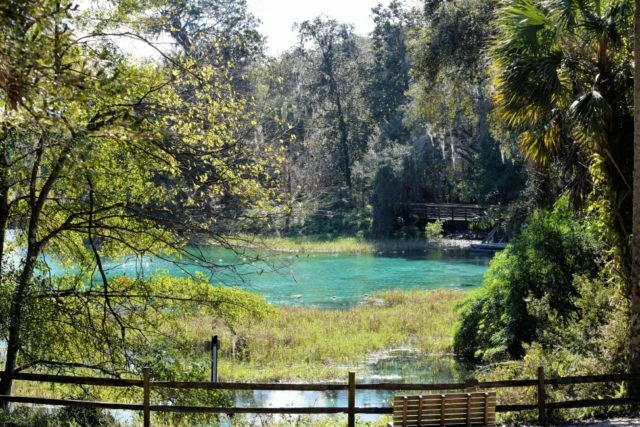 #7 Blue Spring, FL: Manatee lovers, look no further than Blue Spring State Park in Florida. A designated manatee refuge as well as the preferred winter home to a large group of the gentle giants, Blue Spring State Park encompasses 2,600 acres of lush Florida landscape. With 73 degree spring water flowing, swimmers, snorkelers, and, yes, manatees, can enjoy a dip year round. #12 Rainbow Springs, FL: Get lost along the shores of the Rainbow River, paddle through lush gardens, and even stop for a magnificent view of an enchanting waterfall. 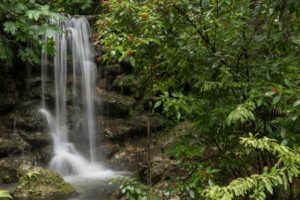 Rainbow Springs State Park in Florida is full of surprises – not only is it one of the largest fresh water springs for swimming in the state, but it is also a haven for bird watching, kayaking, and even tubing!